The Stack, Janet Morton, 2013. Image by Vanessa Tignanelli. Using cassette tapes gathered from local residents as bricks, Morton constructed a giant smokestack on top of 46 Essex Street. A plume of white smoke billowing out of the top is made from acrylic plastic and crocheted doilies. The Stack starts inside the building and continues out through the roof, acting as a sort of ‘vent’ for all the creativity inside to escape the building. The building is a small factory for creativity and The Stack signals to passersby that creative industry is taking place inside. 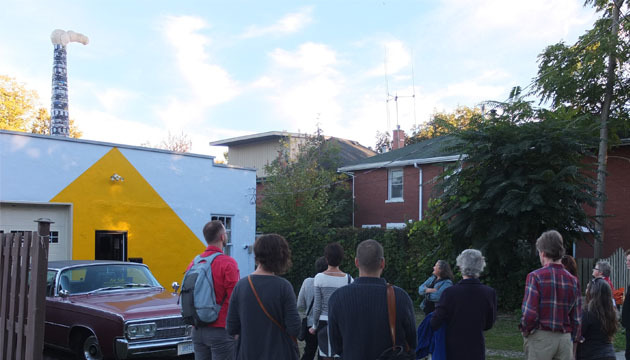 This work was a special commission for the Musagetes Guelph Café, and was installed in time for the Guelph Jazz Festival, building a conceptual connection between these two cultural gatherings.